Stubborn Grace is an exhibition of new collage by Dumfriesshire-based visual artists Denise Zygadlo and Amy Marletta at Thomas Tosh in Thornhill. Denise and Amy have been championing collage in Dumfriesshire in the past year, after they realised they had a joint love of the medium. Amy and Denise challenged themselves to create work to share with each other at regular intervals, initially as encouragement, but which developed into a body of work. The title of this latest exhibition, Stubborn Grace, is a quote from a French female surreal collage artist Claude Cahun. Denise and Amy bring colour and intimacy to their pieces. And they take cleverly crafted advantage of both the opportunities for seriousness and humour that collage allows. Amy Marletta is a graduate of Duncan of Jordanstone College of Art & Design. She completed her degree (Fine Art) in 2002 before going on to complete her Masters of Fine Art at Glasgow School of Art in 2010. Originally spanning video and performance Amy’s practice has always had collage at its core but it has only been in the last six years that this has become its main focus and manifested itself in paper. The process of making these works is a continual self-perpetuating cycle, creating an ongoing archive of scraps - both intentional and unintentional – as bits are carefully selected, left over, ripped up, painted, dropped, stuck, repositioned and so on through a process which is both chaotic and precise. Amy has exhibited nationally and internationally over the years with work shown previously at The Briggait, Glasgow; Centre for Contemporary Art, Glasgow; Dundee Contemporary Art, Dundee; Kunstlerhaus Bethanien, Berlin and Akademie Galerie, Munich. Denise Zygadlo moved from London to Dumfries in 1980. Trained in printed textile design, she began to focus on her own artwork in the late 90s showing regularly, as a professional member, with The Scottish Society of Artists in the RSA and locally in Spring Fling. 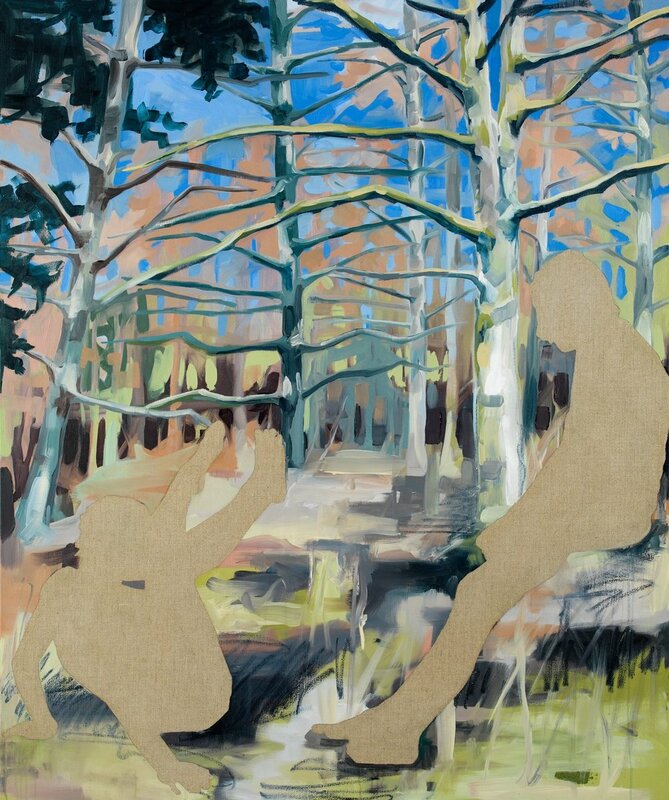 Her work explores the human form and cloth, making live photocopied images to form large collages on silk or canvas. More recently, she has combined her body images with classical sculpture Having worked almost exclusively in black and white. Denise has enjoyed experimenting with colour in these latest series of smaller collages, which in turn has influenced her larger work. Denise has exhibited in Glasgow, London and Berlin and is represented by Arusha Gallery, Dundas Street, Edinburgh. Thomas Tosh in Thornhill went Beano barmy with its exhibition of Comic Art Screenprints in Spring 2019. The Beano celebrates its 4000th edition this year. And artist John Patrick Reynolds is the only screenprinter with permission from DC Thomson, the publisher of The Beano, to use its fabulous archive of images in his work. John’s prints celebrate the most popular characters in the publication, the longest-running British children's comic (which was 80 last year) including: Dennis the Menace, the Bash Street Kids and Minnie the Minx. John, now in his 50s, was brought up reading comics in the days when The Beano would sell more than a million copies a week: "I'm delighted to be able to use these images in my work today." 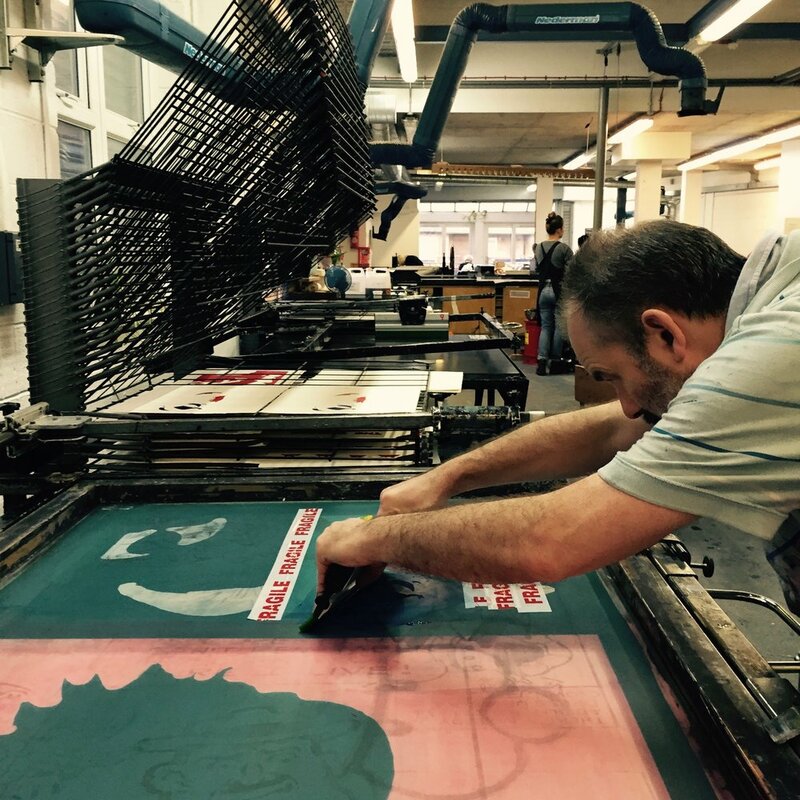 The screenprints are all hand-pulled by John, one colour at a time, in London, on cotton mould-made paper milled in England. Geri Loup Nolan is returning to exhibit at Thomas Tosh ten years after her last solo show and residency at the Thornhill venue. Geri's specially curated winter exhibition shows how she has refined her style, in part as a result of her artistic travels in China and Japan. "Over these last 10 years my work has become more pared down and the alchemy of collaborating directly with nature has become more pronounced. "This can see me directly exposing work to rainfall, or mixing my own colours using local richly pigmented soils, pot ash and charcoal. "Similarly locating the beauty in the found object, humble and discarded materials, always appeal to me and I rarely have difficulty locating them on my travels. They usually find me!" The Edinburgh College of Art graduate was recognised as a New Contemporary by the Royal Scottish Academy in 2011, and Geri has been a recipient of development awards from the City of Edinburgh Council, Creative Scotland, and the Wilhelmina Barns-Graham Trust. In 2014 Geri was invited to be part of the National Galleries of Scotland's Generation exhibitions, its major celebration of contemporary art in Scotland. She has exhibited in Hokkaido and Tokyo, and Zhanjiang and Shenzhen in China where she was undertook artistic residencies. In Europe, she has exhibited in major galleries in Edinburgh, Dublin, London, Nuremberg, Taranto & Lecce in Italy. "The time I spent in Japan and China was extremely varied and culturally immersive, but I honed down those experiences for the work I created. "In China I was staying at Longtoumo Village in rural Zhanjiang. I was surrounded by tropical plantations, shellfish farming and sugar cane and banana fields. The soil was very richly pigmented and I made work that responded deeply to the interaction of the people, the ritual, the earth." Outwith her travels, Geri continues to collaborate with other visual artists and poets, including here in Dumfriesshire. Geri will be at Tosh on Saturday 17th November, and Sunday 18th November, so visitors can talk to her about the exhibition. “It’s terrific to have Geri back at Tosh in our tenth birthday year. Her creative travels over the last decade have been incredibly diverse, and I’m especially jealous of her time in the Far East. The exhibition runs from Friday November 16th to Thursday, 31st January. Geri’s exhibition marks the culmination of Thomas Tosh’s tenth anniversary related exhibitions, which have included solo shows from Fiona Allardyce-Lewis, Clare Melinsky, Katherine Wheeler, Hannah Longmuir and Rachel Meehan, as well as a special exhibition featuring the Story behind Thomas Tosh. Next year's programme includes the return of San Francisco-based Kate Mink to the gallery space. Thomas Tosh celebrated its tenth birthday with a special exhibition launched on Saturday (22nd September) called “The Story Behind Thomas Tosh”. But the exhibition wasn’t the tale of how the thriving café, gallery, event space and retailer has grown since it launched in 2008. Instead it focused on the fictional character ‘Tammas Tosh’ (also known as Thomas Tosh) and his creator Joseph Laing Waugh, who was born 150 years ago and whose popular writing put Thornhill on the cultural map at the turn of the twentieth century. “It was too good an opportunity to miss with Thomas Tosh’s tenth birthday, and the 150th birth anniversary of Joseph Laing Waugh. “Waugh was a very respected writer who gathered a big following with his books and collections of stories featuring characters including Robbie Doo, Betty Grier, Luiffy the Grocer, and of course Tosh himself. “He was a champion of the Scots dialect, and immortalised Thornhill by basing his characters on local types who he met growing up, hearing stories from ‘worthies’ who used to sit around the village cross. “He saw the explorer Joseph Thomson return from his first expedition, and became friends with E.A. Hornel and other artists. The exhibition featured items from the Joseph Thomson Group’s current collection including a portrait of the writer on loan from his great-nephew’s family. Gladys and her husband Dave opened the exhibition, and Tammas Tosh, and Luiffy the Grocer made an appearance on Saturday 22nd September, brought to life by Denise and Mark Zygadlo respectively. The exhibition ran until Sunday October 21st. 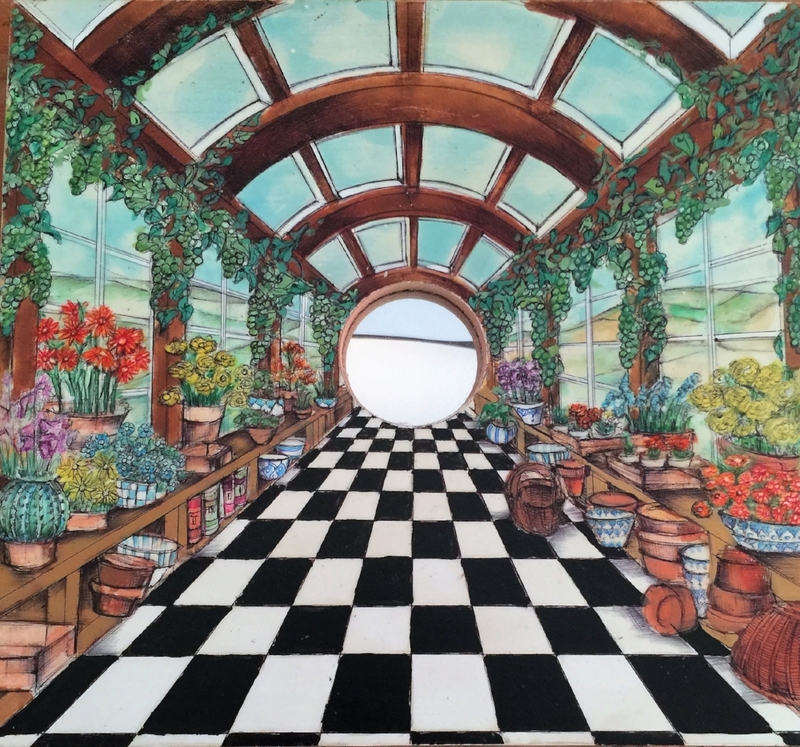 Fiona Allardyce Lewis’ new exhibition at Thomas Tosh celebrates our love of indoor plants. And the gallery is decorated with house plants to echo the conservatories, glass houses and green houses that feature in Fiona’s richly drawn works. The Nithsdale artist has brought summer colours to her pieces which combine concave mirrors, watercolours and ink to create characterful interiors, brimming with detail. One of Fiona's richly detailed mirrors. This is Sun Room. It's been purchased but other pieces are available to buy. The exhibition started on Friday 27th July and runs until Sunday 2nd September. 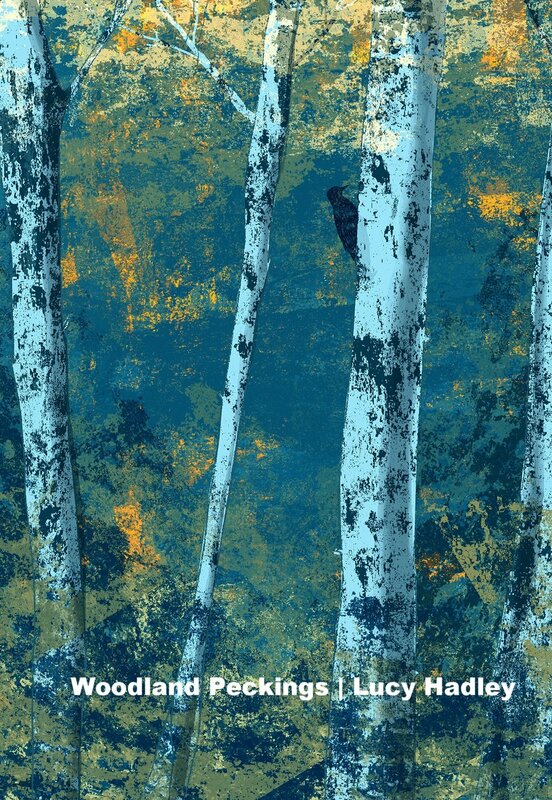 Rachel Meehan was born and educated in Dumfries before studying Fine art (Printmaking) at Lancashire Polytechnic then finally completing her Postgraduate studies at Glasgow School of Art in 1990. Her first solo exhibition was at Gracefield art Centre in 1990 followed by numerous solo and group shows including Aberdeen City Art Gallery and the Glasgow Print Studio. After a long break, Rachel launched new work in Glasgow in September 2017, when she met Thomas Tosh partners Paul O’Keeffe and David Cripps and began arranging her return exhibition to the region of her birth. And her new exhibition Bold Blooms has just started at Thomas Tosh gallery in Thornhill and runs until July 22nd. Scottish Borders-based artist Hannah Longmuir is exhibiting her detailed nature drawings at Thomas Tosh in Thornhill from Friday 11th May. Hannah focuses on the fields, woodlands and hedgerows around her. She creates calm, delicate drawings, carefully observed and full of character. Original pieces and prints will be on exhibition and available to purchase. Hannah has also produced a range of nature-inspired cards and stationery, which are also on show. Hannah’s exhibition runs until Monday 18th June. We're hosting Nithsdale artist Katharine Wheeler who has just been awarded a Barbican Fellowship, and recently had a solo exhibition at Gracefields in Dumfries . She brings a thoughtful approach to dealing with the figure and landscape. Thematically she is currently focused on capturing the human figure and movement in both charcoal drawings, and oil on canvas. Thomas Tosh kicks off its ten-year birthday celebrations with a new exhibition from the in-demand printmaker Clare Melinsky. The exhibition ‘Out and About’ runs throughout February and focuses on Clare’s skill in using lino cut printing to capture the character and colour of the outdoors: from gardens and country scenes to handsome buildings. Among work featured will be Clare’s recent illustrations for Natural Selection: a year in the garden by Dan Pearson. Clare stays just outside Thornhill and has exhibited at Tosh three times since its launch in May 2008. Those previous exhibitions demonstrated the breadth of her art: from the covers of the Harry Potter Signature editions; her work for a wide range of publishers and major businesses; and her prints recording the elegant architecture of major Dumfriesshire landmarks. 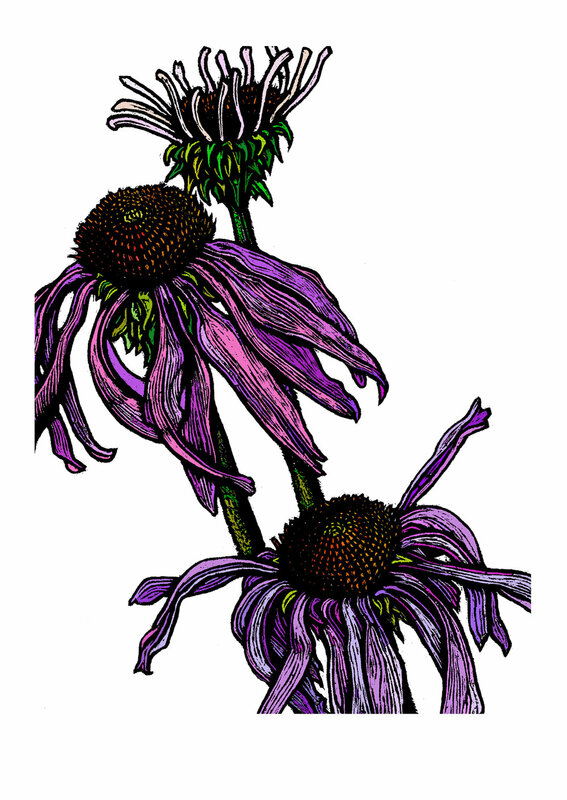 Clare will also be holding her lino-cut print workshops every Saturday in February at Thomas Tosh. Each class is limited to six participants to ensure they get the maximum guidance from Clare. The first workshop is now fully booked, but there are places remaining on other Saturdays. You can book below. Sign up to our newsletter for all the latest news on our upcoming events in 2018. Below are some highlights from the past couple of years. Highlighting Lucy Hadley, John Patrick Reynolds' Comic Art and the work of Fiona Allardyce-Lewis. Come and see their work in the festive splendour of Thomas Tosh. An exhibition of Comic Art prints of classic Thelwell cartoons and more lovingly reproduced by London based screenprinter John Patrick Reynolds. Galloway-based Lucy Hadley’s love of the Scottish outdoors inspired her exhibition at Thomas Tosh in Thornhill, which ran until Sunday 3rd September. Lucy combines line drawing, inking and computer technology to produce high quality prints inspired by her Scottish adventures. Some settings are directly recognisable, while other scenes are more interpretative. “Some images are straight from my sketchbook; so you’d recognise Crail in the North East if you’d been there. Lucy, whose love of all things outdoors also extends to her work as a ranger at Galloway Forest, will be exhibiting some of her favourite works and will also be launching limited edition prints for the first time. Lucy studied Graphic Design and Illustration at the University of Cumbria and graduated with a First Class BA (hons) degree. Californian-based artist Kate Mink made the trip back to her homeland of Dumfriesshire especially for this year’s Spring Fling and her new exhibition at Thomas Tosh, her most successful to date. Kate has lived in the US for 20 years but grew up in Nithsdale and was educated at Wallace Hall Academy in Thornhill. And the theme of ‘home’ and longing for the comfort it represents was at the heart of Kate’s exhibition that ran from the 27th May to the 2nd July. The following gallery shows pieces that are still available to view on request and purchase. Kate uses the technique of encaustic painting. She carefully places found images and materials including old photos between layers of bees wax, resin and pigments. The wax process gives her work a warm hued look. And the old photos and materials give a sense of memories stretching back to past eras. During Spring Fling, Kate had a special pop-up studio upstairs, showing visitors how she created her work, and the different media she used. Kate was part of the Springback scheme of Spring Fling through which artists who have a connection to Dumfries and Gallloway but don’t live here are invited to take part. Kate is now living in the San Francisco Bay area with her family. She has an American born son and daughter. She is a graduate of the Glasgow School of Art. In the gallery below you can see works that sold. Sign up to our newsletter at the end of this page for all the latest news on our upcoming events in 2017. Below are some highlights from the past couple of years. Celebrating 20 years of the Thornhill Wallhanging. The Thornhill textile wall hanging that was created by local people at the end of the last century celebrated its 20th anniversary in 2016. And to celebrate, mid-Nithsdale based artist Denise Zygadlo curated a special exhibition Stitch in Time 2016 and associated events at Thomas Tosh. Denise originally organised the creation of the hanging as part of the ‘Stitch in Time’ project, backed by the then Dumfries and Galloway Arts Association (DGAA) in 1995. Many Thornhill people, old and young alike, came together and using techniques of appliqué, embroidery and quilting produced the hanging. Denise formed the basic design from historical records and photographs. Volunteers then started work on individual sections of the community project. The names of many of the contributors are sewn around the edge of the wall hanging. You can watch the slide show from the exhibition below. Thomas Tosh’s autumn 2015 exhibition in Thornhill was small and perfectly formed. Small World featured loans from the miniatures collections held by Jane Murray-Flutter, Dorothy Gault and Dorothy Hill, respectively. Everything from classic furniture to cutlery, chandeliers to Charlie Chaplin have been reduced in scale by talented miniaturists whose work has been acquired by the three Nithsdale-based collectors. Visitors marvelled at the perfect precision on show from kitchen scenes to French high court glamour. The exhibition also featured tiny letters received by Jane Murray-Flutter’s late mother, the famous writer Rumer Godden, from Tasha Tudor, who illustrated Rumer’s classic book: The Doll’s House. Tasha created an imaginary correspondence between the characters in Rumer’s story and her own collection of dolls. Glencairn Quilters Exhibition | Ended run 10th October. Handcrafted quilts made here in Nithsdale by the Glencairn Quilters. The Group made a special quilt thas raffled for charity. That quilt is on show too. Thornhill Arts Summer Competition 2015: Ended run 26th June. Over 40 entrants showed their enthusiasm and talent in this year's show. Local artist Victor Henderson judged the winners. And they were: Category A (aged 6-11:years): Lucy Robson. Category B (aged 12-16) Katelynn Sneddon. Category C (adults): Margaret S Milligan. Congratulations. Katleynn's collage won it for her in the aged 12-16 group. 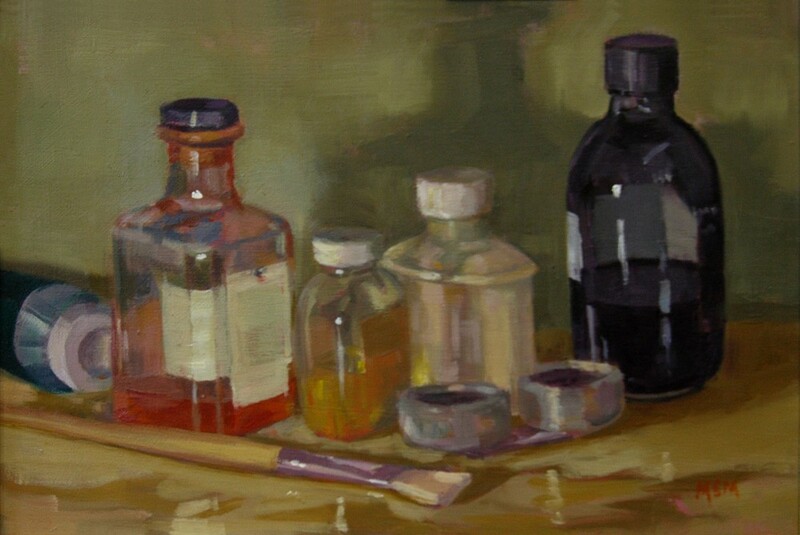 Margaret's oil Tools of the Trade won in the adults group. Keep up to date with all Tosh's news by subscribing to our newsletter below.